Lockpicking is a skill that takes years upon years to master. Locks come in all sorts of shapes and sizes, but have common ground in how they work. Most cylinder locks have "tumblers," which are metallic cylindrical objects that sit vertically to the actual locking mechanism. Tumblers have five or six holes with rounded key pins of various height in them, each needing to meet an exact height or the cylinder in the center (the lock itself) will not be allowed to turn. 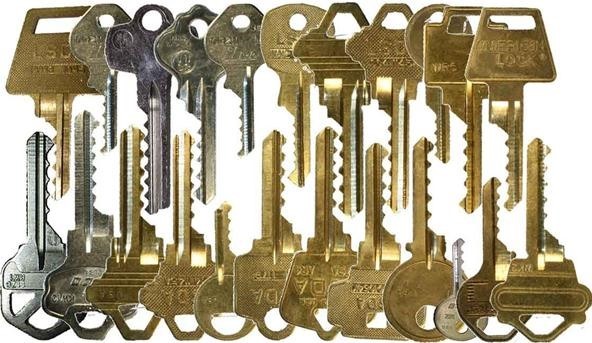 This is the reason why you see those "mountains and valleys" on keys, and why these types of locks are called pin tumbler locks. Each is unique. Today's Null Byte is going to demonstrate how to effectively make what is called a "bump key". A bump key can open any lock that it fits into. It's helpful to have in your pocket if you ever lose your keys, because it can open your door lock and your deadbolt, even if they normally require seperate keys. I keep mine in my wallet. The teeth in a bump key are set really low so that you can fit it into locks where the tumblers may be set as low as possible. The teeth are steep and jagged because when you "bump" the key while applying torque, for a split-second, all of the tumblers will bounce up into their perfect positions allowing a window for you to open the lock. The torque you apply makes the tumblers stop once they reach the desired height. Please don't use this key to go into places where you do not belong. A bump key is made by using a triangular file (they're at every hardware store… very cheap) on the blank key. If you don't want to use a blank key, you can just use one of your spare house keys. Step 2 Bump Open a Lock! Put the key into a hole at the end of the plug (exactly how you would normally open a lock). The bump key pictured above would fit into most cylinder locks and deadbolts. After it's pushed all the way into the lock, pull the key out until you feel it click twice. Take your blunt object (I use a pocket knife) and hit the key with a bit of force, while applying torque (pressure) to turn the key in the direction you need to in order to open it. It's a little hard to get at first, but once you get the feel for it, you can open it the first try nearly every time. Here's a video demonstration on how I used one to open my garage. Good job making your first bump key! Talk with me one-on-one at our IRC channel! You can also follow me on Twitter and Google+ to get in touch with me. Happy hacking! News: Bam Margera in Saw ! Now just to be clear, the blank key has to be the correct size and shape for the lock, it's not quite able to pick EVERY lock :P But yea, bump keys are pretty awesome. I thought about making a mechanized pneumatic one sometime.. If I do I'll definitely put a tut up for it. Sick man! :) Btw, it was mentioned in the tutorial, you must have missed it "A bump key can open any lock that it fits into." I was making fun of your title :P Not that it's bad, just that I'm pulling your leg. Virtually. Your virtual leg. Not the third one. Oh my :O. Haha, funny ;p You should join the programming project later this week :). Programming project? I'ld be down.. more info though? Next time you check haxme would you mind checking the thread in my status? I think I read it already now, right? I'm thinking a best-tool competition. Maybe even something more specific. If you use a flat rubber washer, it makes it a lot easier to do. I don't remember what size washer though. this is awesome, man. i seriously appreciate what you're doing here. Haha, thank you for the flattery x]]. Then I'm pretty sure it's the "bumping" that you can't quite get x]]. it's not quite able to pick EVERY lock :P But yea, bump keys are pretty awesome. I thought about making a mechanized pneumatic one sometime. Seriously. I saw the real key in your hand. And the trade off. Bump keys do work. Just wasn't done in this video. I recently tried making an Insurance claim for a gold bracelet which disappeared from my home. They disallowed my claim claiming that there were no visible signs of a break in. Does this mean that Insurance Co's can get out of any legitimate claims if a bump key was used , leaving no visible sign of a break in?